There is freedom from embezzlement and slavery along with a transfer of wealth coming now. But before that takes place the embezzlement must be stopped. Our freedom on many levels has come under attack. For several weeks I have heard the word “embezzlement” in my spirit. The obvious question that followed is “Where?” Where was the embezzlement happening? As I prayed I lifted up area after area. Was it in our ministry? My business? At our church?And then the answer became clear.The embezzlement that was causing slavery to debt and lack was everywhere, yet with that word was good news, there is about to be a reversal as we pray. This was a call and mandate to pray that will release freedom. Our nation, our states, our cities, our businesses, our families have been under an insidious plan to transfer the wealth of America and its people to bankruptcy. Money is always tied to power and if America is drained of its wealth and the people of wealth, we have been drained of our influence. 1. Casinos now dot the landscape of almost every city and state across our nation. Their approval sanctioned as a help for states to fund education. Yet, in reality, many of the states with the highest ratio of casinos are also at the high end of the nation for poverty levels as the lure of “instant wealth” drains the revenue of families who can ill afford the loss. Worse, the revenue the casinos pay to the states to go toward education is often not even an increase to the budget as that same amount that the state already had in the budget is then moved elsewhere, so there is no increase realized at all. It is an embezzlement on two fronts. According to a report by the Congressional Research Service, “federal outlays on all means-tested welfare programs targeted for the poor hit $746 billion in 2011 and have continued to rise since.” Taxes have continued to increase to pay for this welfare. Rather than help those in need learn to fish and take care of themselves we tie them to poverty and the wealth transfer continues as it reaches further into the pockets of taxpayers. Embezzlement and slavery. 3. The Global Warming Initiatives and Environmental programs have drained billions of dollars from America while transferring that wealth to other nations who are not required to hold to the same environmental standards. The Paris Climate Agreement alone was estimated to drain 1.1 million U.S. jobs in the Industrial sector, increase the electricity costs of an American family of four by between 13 percent and 20 percent annually and create a loss of income of $20,000 by 2035. It also would have transferred 5.1 BILLION dollars to initiatives by Elon Musk to continue his work to create solar panels and electric cars. According to the Merriam-Webster dictionary the word “embezzle” means: to appropriate (something, such as property entrusted to one’s care) fraudulently to one’s own use. There has been an embezzlement happening across our nation at every level, but it is going to be reversed as we stand and pray. This blessing and reversal is tied to an action on our part. As in the days old, the Hebrews were held in slavery to Egypt as their time, energy and finances were drained from them. It was completely beyond their control. But just as their slavery was broken off, followed by a great transfer of wealth, so we will see a breaking off of slavery and lack in this present day. As our nation has been in slavery to these laws and mandates that have grown out of control, as we cry out to God for release, there will be a breaking off of the injustice and slavery followed by a transfer of wealth. We are about to see a freedom from embezzlement and slavery released into homes, families and marriages. The transfer of wealth that has been created to take from us will not continue as they have mandated. There will be a reversal, returning it to the house of God and to the righteous. Are you ready for your children to come back? That is part of this season. Call them back. 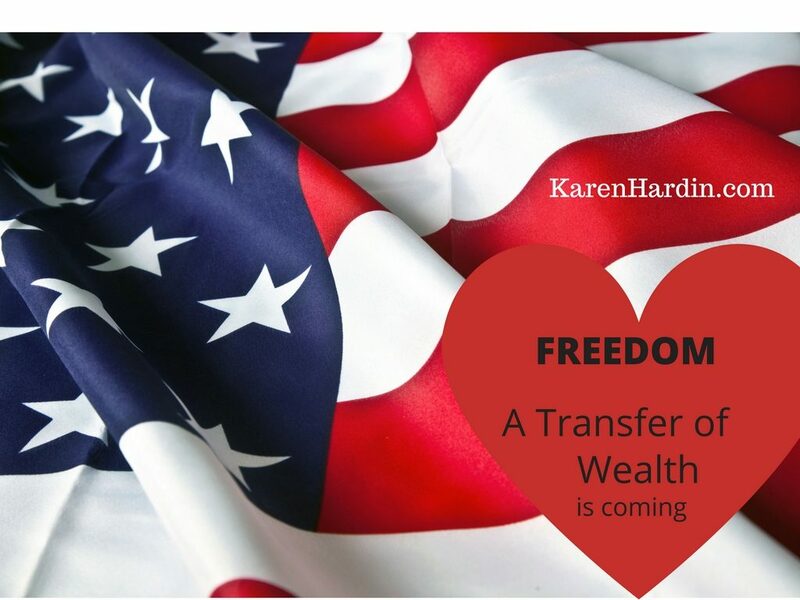 Are you ready for your wealth to be returned? That is part of this season. Call it back. That which has been stolen, call it back seven fold! But when he is found, he must repay seven fold; he must give all the substance of his house.Proverbs 6:31. Now is the time to align with His Word and call back into your home that which has been stolen. This is a call for prayer for you personally, for your families, your business, your cities and states, your church and our nation. As we pray on every front, that the slavery will be broken, our children will return, and for the restoration through the transfer of wealth to begin. If this word resonated with you, or if you would like prayer, please email me here. Moore, Stephen, “Welfare In America: A $1 Trillion Tab And Rising” The Heritage Foundation, http://www.heritage.org/welfare/commentary/welfare-america-1-trillion-tab-and-rising. Accessed July 1, 2017. Wilde, Robert.“Elon Musk’s $5 Billion in Govt Subsidies Helps Make Ends Meet,” Breitbart News, http://www.breitbart.com/big-government/2015/05/31/elon-musks-5-billion-in-govt-subsidies-helps-make-ends-meet/. Accessed July 1, 2017. Hirsch, Jerry, “Elon Musk’s Growing Empire is Fueled by $4.9 Billion in Government Subsidies” LA Times http://www.latimes.com/business/la-fi-hy-musk-subsidies-20150531-story.html. Accessed July 1, 2017. Laszewski, Robert. “Why Are The 2016 Obamacare Rate Increases So Large?” Forbes, https://www.forbes.com/sites/realspin/2015/06/10/why-are-the-2016-obamacare-rate-increases-so-large/#2f753106103e. Accessed July 1, 2017.